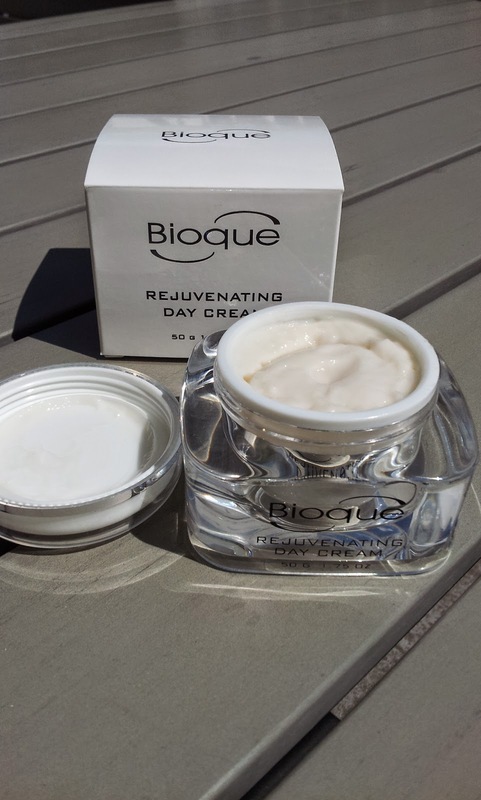 Bioque Global is an American-based skincare company with approximately 14 products in their line-up. 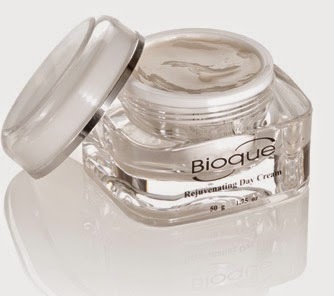 One of those products, and the one I will be reviewing in this article, is the Rejuvenating Day Cream. I recently moved and this item was sent to my old address then forwarded on to my permanent address, and than I finally received it after its little adventure through the post office. So I wasn't able to use it for very long. First, I love the packaging. It's minimal but it tells you in large letters right on the box what it is. The container for the day cream itself is very sleek. The outside section of it is a clear plastic and you can see the cream right through it. The cream has a mousse-type of bouncy consistency. You can basically bounce your finger off it. The cream goes on smoothly and is very hydrating. It can be used on your face, neck and back of hands. I didn't realize I could also use it on my hands at first. So I gave it a shot. I first washed my hands with soap which caused the back of my hand to feel dry afterwards. I then rubbed some of the cream on and immediately the skin on the back of my hands felt smooth. I plan to keep trying this method on days my hands need a little pick me up! 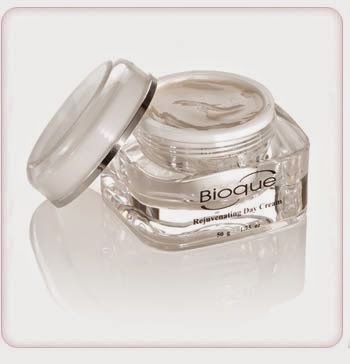 Bioque's website claims that in as little as four weeks you will see reduced lines and wrinkles. Unfortunately I was not able to use the product for four weeks so I cannot attest to this claim, but I plan on continuing to use the product on the cold winter days. 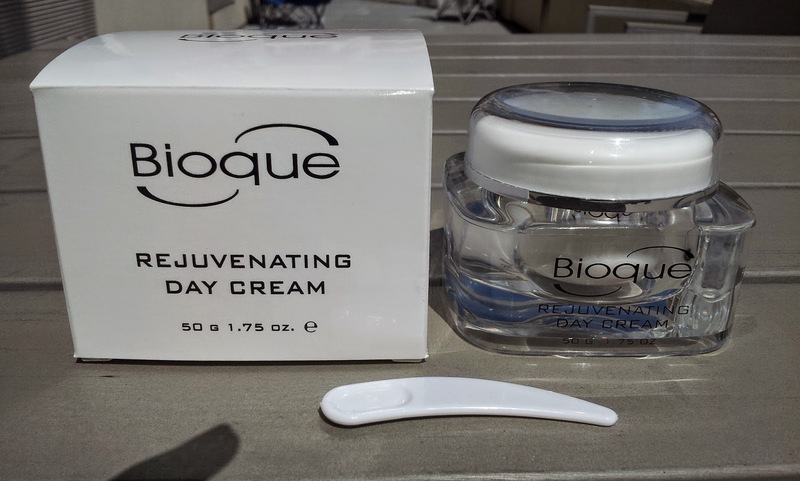 Since Bioque's Rejuvenating Day Cream might be just a little too hydrating for my very oily skin during the hot summer months it might not be a good idea. However, if you have normal to dry skin I would most certainly recommend this cream. I had two complaints about this cream. First, it has too much of a chemical smell. However, it dissipates rather quickly after applying it on your face. My second complaint was that it came with a small plastic boomerang looking item that comes inside the packaging but has no explanation as to its use. I can only assume that I'm supposed to scoop some of the cream out with it in order to avoid contaminating the jar with the germs on my hands. Nonetheless creams don't stabilize well in jars and they collect bacteria due to the constant sticking of our fingers and things into them. So I would urge the company to consider bottling this in an air tight pump container. Many cream companies are now moving towards this method for hygienic and quality assurance of the ingredients. I would recommend this cream to someone who has normal to combination skin. For those with oily skin, this might be to much for you. While this isn't for me I like the detail you've gone into. I will forward this on to friends who are into this though. Thank you so much for your feedback on this product. I already use a product that I am very happy with, but I appreciate knowing there are others out there.